Steven Marakeng Mpyana was born on 6th August 1983. 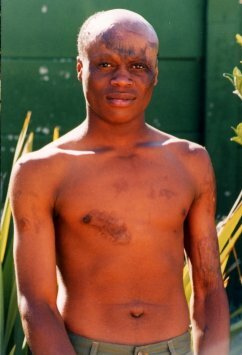 He now lives in Mabopane, not far from Pretoria. He came to Children of Fire for advice and help on Wednesday 3rd July 2002 in Johannesburg. At the age of 14 Steven was cooking some chips on an open fire. The fire was in an unfinished building � brick walls and a corrugated iron roof but no windows. He finished cooking and put the hot fish oil on the shelf above his head, to keep it away from younger children who were there. The pot was not put on the shelf properly and fell on him. He ran to the water bucket and put his head in it to cool it. His aunt got a neighbour to drive him to Mametlhake hospital near Hammanskraal, 15 minutes or more drive away. He was admitted on 3rd August 1996 and discharged on 25th September 1996. Steven returned to school. He has continued his studies and is now in tertiary education. However, he remains traumatised by the rejection of his peers and wants more than anything else to look �normal�. Children of Fire believes that over an 18 month period, with two tissue expanders and a healing period inbetween their use, Steven could achieve close to a normal hairline. We requested Garankuwa Hospital to arrange this reconstructive surgery for him. If, and only if, the youth�s mother�s medical aid and the hospital cannot provide such equipment as the tissue expander, the charity said that it would then do so. Each expander costs some R3000 (or more depending on the exchange rate, as they are imported). Observations (Weds July 3rd 2002): Steven has hair on the right side of his head and at the back of his skull, down to the nape of his neck. He has no hair on the top of the head or on the left side. 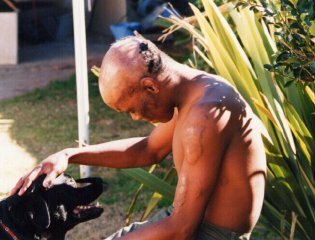 On the left side his ear is fixed (at the top) to the scalp by the burn injury but it would be relatively easy to release that. Tissue expanders could reinstate his hairline. He is missing an eyebrow but has good bone structure so his face is not unpleasant to others, especially when he is wearing a hat. He does also have scarring on his shoulder and arm but was told not to expect improvement there. He seems not to keloid (i.e. not to have dramatic raised scarring) so that also makes him easier to �reconstruct�. His mother has some medical aid. It is not clear what it could cover even after we phoned them. They said that Steven must see a surgeon and that the surgeon must fax a motivation including all the tariff codes needed. In order to see the surgeon, Steven needed a doctor's letter ... but one from Children of Fire sufficed. Steven is booked in for surgery on September 3rd 2002. He knows that it is still a long and difficult path ahead, but his message was simple. He said: 'Thank you for changing my life.' Steven also says that he wants to get involved in preventative work, educating youngsters about the dangers of burns and fire. Pretoria Academic Hospital treats patients from the Pretoria area. Any patient 14 years and older has to go to outpatients with a doctor�s reference letter. The contact person there is Sarie Duyker Tel: (012) 354 1666 Fax: (012) 329 4589. She suggested that people don't fax as faxes 'get lost'. Garankuwa Hospital outpatients attend on a Monday or a Thursday very early (around 07:00) with a doctor�s reference letter. The contact person is Ereline Snyman (012) 521 4006). The hospital serves the Warmbaths, Pienaars-river, Pietersburg, Hartebeespoort, Mabopane, Soshanguwe, Garankuwa areas. Kalafong Hospital serves the Witbank, Middelburg areas and outpatients are seen on Tuesdays.